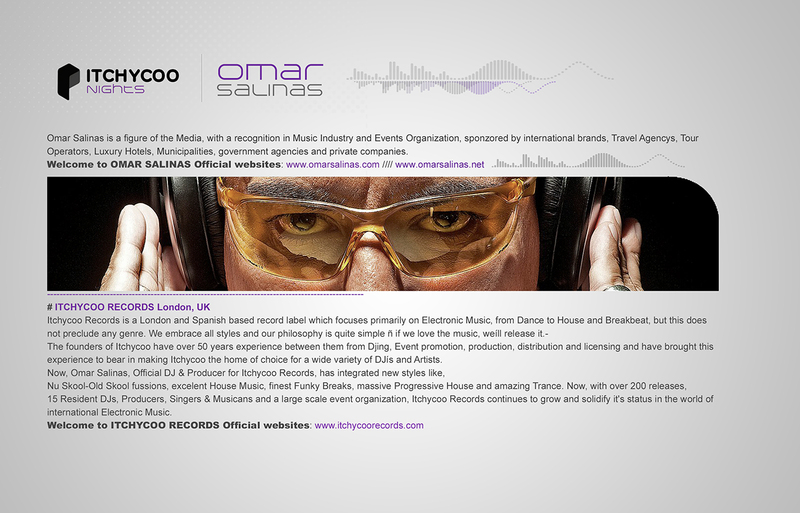 Biography // OMAR SALINAS – DJ / Producer / Promoter ITCHYCOO RECORDS Official Resident DJ- Producer. Progressive House with Tech House Minimal rhythms and forceful Break-Beats. OMAR SALINAS Live DJ sets play the UNDERGROUND HOUSE blend the most radical Afro Latin rhythms into the TRIBAL. This is how gets the total of a devoted public, with a devastating louds, darks and strongers bassline.!!!. Soul and R&B Divas as CARLA DIAMOND, Rock & Blues Superstars as ARTHUR LOUIS Feat ERIC CLAPTON, DAVID KNOPFLER (Dire Straits) or MIKE OLDFIELD and DANNY TENAGLIA – this last one helping him achieve his first hit worldwide; ì182 BROTHERSî, he has been acclaimed by the most charismatic places in the world, obtaining his own record label call, ITCHYCOO RECORDS London UK. You can open it in a new window by clicking on the image below, or by clicking “save as…” in order to download the file directly to your computer.